I really wanted a plain cake that I can play around with. 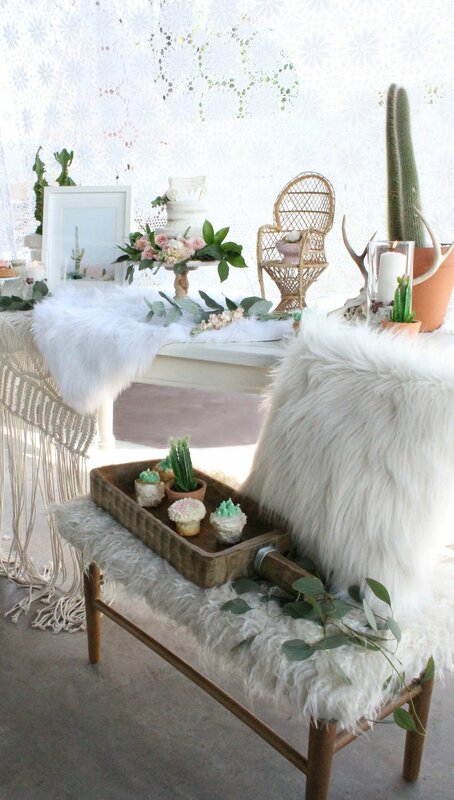 I knew I wanted to decorate it by adding fresh floral to compliment the theme of the party I was styling. I went to my local grocery store and found myself at the "Bakery" section. I asked the baker if they would make me a plain 2 tiered naked cake and she agreed. I was so thrilled because the cake literally cost me about $45.00! What a great deal right?! I then went to Trader Joe's to look for some fresh floral. They have a great selection. I ended up grabbing some eucalyptus, wild bunches and spray roses. Did I mention that their prices are so reasonable? I was so happy with the selection I found. I started layering the eucalyptus and mixing in stems from the wild bunches first. I used regular kitchen scissors to cut pieces from the stems. I cut the stems of the spray roses and was adding them in between the greenery. I honestly eyeballed the entire thing. There is no right or wrong way to doing this. The only tip or suggestion I would really give is to focus on adding the floral to the bottom of the cake and add a few touches to the top. You should probably skip the between layer so it's not overwhelming. If you have a large cake that has a lot of space between the layers then I would suggest adding a few flowers with pops of greenery in between. I hope you enjoyed this easy cake decorating D.I.Y. I really love how this party turned out! To see more from this party Click Here.